With the possible exception of the “new towns” constructed since the Second World War, it is unusual to find a town or village in the United Kingdom which does not have a memorial to those who lost their lives in conflicts past. It is rare, however, to find a memorial to a group of men who participated, without necessarily losing their lives, in a single battle, and a sea battle at that. Yet this year, in the part of the city of Sunderland known as “old Sunderland”, that is exactly what happened. 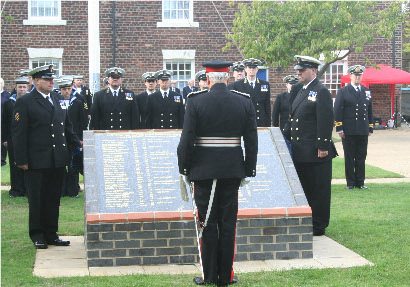 A memorial, listing the names of the seamen from that specific area who were at the battle of Trafalgar, has been unveiled. To be fair, the existence of this brave group of men has never been forgotten locally, mainly because of the existence of Trafalgar Square, a set of houses built (and still run today) by a charity called the Sunderland Aged Merchant Seamen’s Homes. These historic and picturesque almshouses were built in 1840 – some five years before the square of the same name was completed in London – in honour of the Sunderland men at the battle. Yet those names have never been on continuing public display. Between them, they were serving on 28 of the English ships at Trafalgar, but a number were on board Collingwood’s ship, HMS Royal Sovereign, and it was therefore quite fitting that that this tribute took place in 2010 and formed part of the Collingwood 2010 Festival. The monument was unveiled by Her Majesty’s Lord Lieutenant for Tyne and Wear, Mr. Nigel Sherlock, in a ceremony at the Trafalgar Square Homes, at 11 am on Wednesday 15th September 2010. A service of dedication was conducted by Canon Stephen Taylor of Sunderland Minster. Although there was an invited audience, provision was made for the public to witness and be a part of the ceremony and, braving high winds and showers, over a hundred turned up. 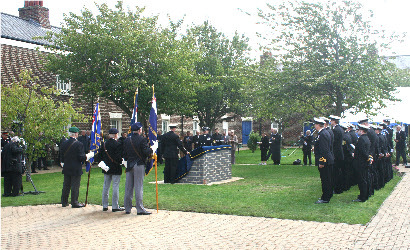 The memorial takes the form of a tablet of blue-grey marble with gold lettering, listing the men, their ages, ranks and the ships on which they served and is set at an angle, tilted towards the flag-staff that stands in one corner of the Square. It was commissioned from a local company, Ian Wood Memorials of Sunderland. The youngest of the Old Sunderland contingent was 14-year old Thomas Brown on board HMS Minotaur and the oldest 56-year old Quartermaster John King on board HMS Victory. King was in fact, one of three of this group who were actually killed in action during the battle; a further two were wounded and one died of his injuries shortly after the battle. 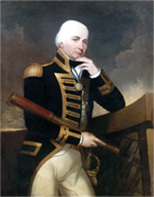 In addition, William Featherstonehaugh, a 49-year old Quartermaster on the famous HMS (“fighting”) Temeraire, who must have been delighted when he was ordered to transfer to a French prize, the Fougueux, with orders to take her to England, was drowned when the vessel ran aground and broke up on the night of the 23rd October. Just six of the Old Sunderland men received the Naval General Service Medal with Trafalgar Clasp, commonly referred to today as ‘the Trafalgar Medal’. However, as this medal was not made available until 1848, some 43 years after the battle and could only be awarded to a living survivor, or the relatives of those who died after June 1847, and additionally that applications closed in 1851, this low number is of little real surprise. Today, Old Sunderland is just a part of a relatively new City, but there are those who still recognise it as a distinct and defined area and remember when a man would ‘not cross the boundary to drink in an adjacent part of the town’. There are those too, committed to preserving its heritage before it disappears or is swallowed up in a wider archive. Interestingly, Trafalgar Square lies but a stone’s throw from the grave of Jack Crawford, who was reputed to have climbed the mast of HMS Venerable at the Battle of Camperdown to nail Admiral Duncan’s colour to the mast top… but that is another story. 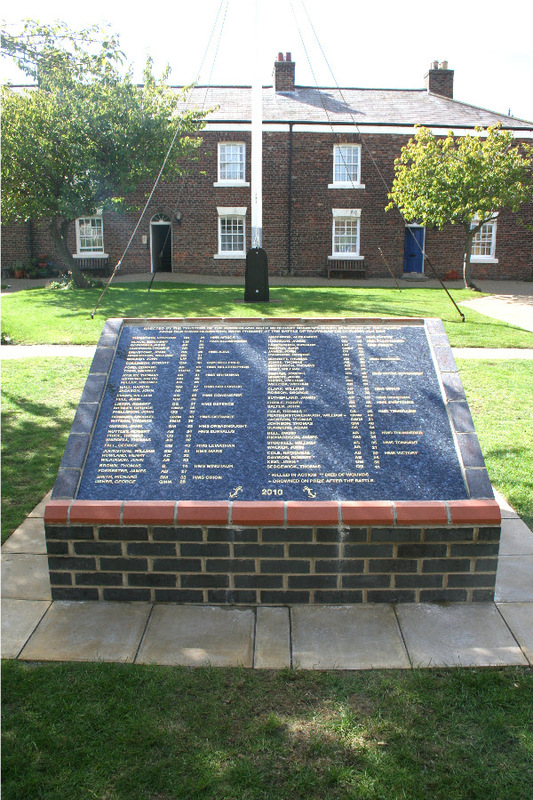 The Sunderland Aged Merchant Seamen’s Homes are located at Trafalgar Square, Hendon, Sunderland, SR1 2BW and the memorial can be freely accessed during the day.